- It is claimed that Sargon's planet is class M, but it is also established that it no longer possesses an atmosphere. 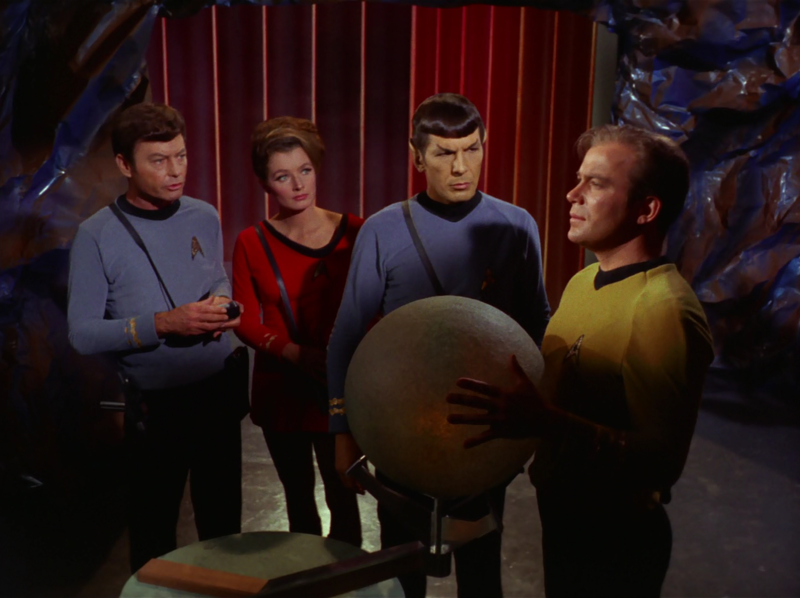 Since the designation of class M has been consistently reserved for Earth-like planets, it would seem to be a continuity error that a planet can be regarded as class M despite no longer possessing an atmosphere, even if it at one time did possess Earth-like qualities. - This episode in some ways rationalizes the problem of why so many aliens look so much like humans by heavily implying that Sargon's race seeded humanoid life throughout much of the galaxy 600,000 years ago. 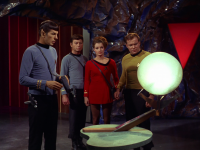 - This episode and its writer, John T. Dugan, were nominated for a Writers Guild of America Award for Best Written Dramatic Episode in 1968. 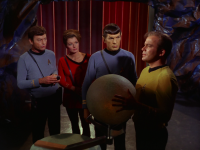 - Kirk states in this episode that the U.S. Apollo program successfully reached the moon, a remarkable statement given the fact that at the time this script was written, the feat had not yet been achieved. - Scotty: "You could materialize inside solid rock!" - McCoy's terror regarding the transporter. - Kirk: "We faced a crisis in our earlier nuclear age. We found the wisdom not to destroy ourselves." - Sargon: "There comes to all races an ultimate crisis which you have yet to face." 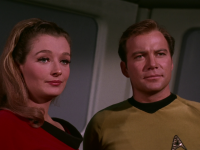 - Kirk's speech about extending goodwill to this potentially dangerous alien species; calling for volunteers rather than ordering people to participate. - Possessed Spock getting all emotional. 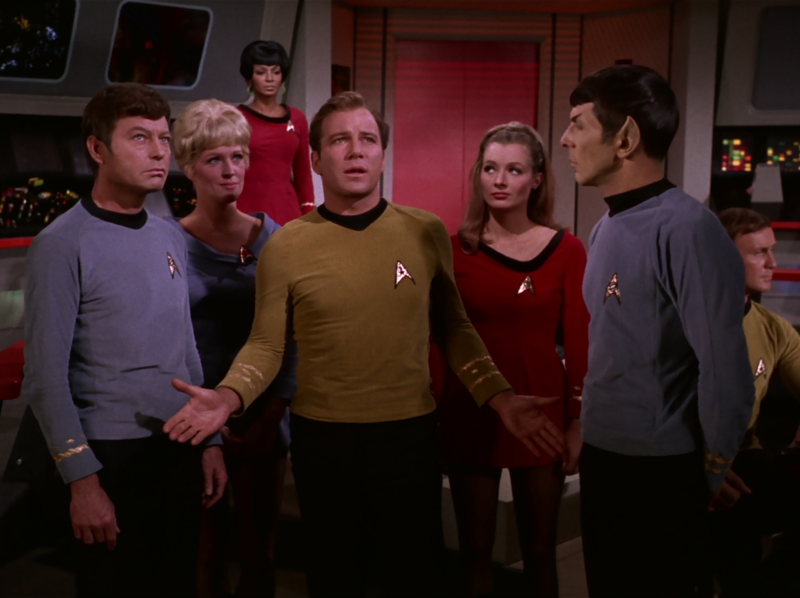 - Possessed Spock to McCoy: "I'm surprised the Vulcans never conquered your race!" 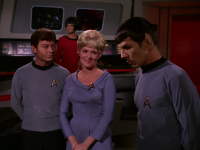 - Possessed Spock using a Vulcan mind meld to manipulate Nurse Chapel. 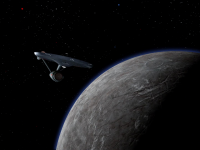 In this leg of the Enterprise's five year mission while having traveled hundreds of light years farther than any Federation starship has ever traveled before, Captain Kirk and his crew happen upon a most unusual discovery: the remnants of an alien race which colonized the galaxy 600,000 years ago, possibly even seeding life itself on both Earth and Vulcan! This little bit of exposition goes a long way towards rationalizing the problem of why so many aliens look so much like humans on Star Trek, so as you might imagine this episode has earned some bonus points from me for that. Unfortunately, the crew regards this bit of exposition with little more than a "gee whiz" response, so the impact is somewhat less than what I'd have preferred, dramatically. 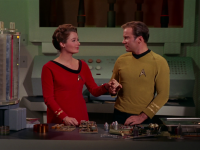 Nevertheless, the episode's main focus still has much to offer. At first glance this episode seems to start off as yet another "godlike alien takes the crew hostage" story, but fortunately the episode rises above this cliche rather quickly by establishing these particular godlike aliens as remarkably benevolent. All except for the amusingly evil one that inhabited Spock, anyway. Shortly after the first encounter, I couldn't help but join in Kirk's enthusiastic optimism for aliens of the week that were outwardly cooperative and not hostile during his motivational speech to the crew, soliciting volunteers in extending a helping hand to the aliens in the hopes of forming a fruitful alliance. In a universe where godlike aliens seem overly plentiful and nearly always mad with power, this was a refreshing change of pace. 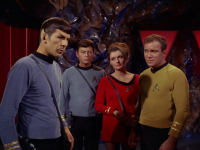 Likewise, at first I was worried that the evil alien inhabiting Spock would ruin the overall likability of the aliens of the week, but thankfully Leonard Nimoy's delightfully Machiavellian performance and the refreshingly amoral writing for the character saved the day by at least making our cliched antagonist suitably amusing, while giving rise to well utilized opportunities for the plot to exploit Chapel's attraction to Spock for both comic relief when inhabited Spock compliments the poor nurse as well dramatic appeal when Spock's consciousness is literally hidden within Chapel's body, much to her overt satisfaction. Unfortunately, at least one too many such misdirections pile up by the end of the episode. Combine that with the fact that the "godlike alien takes the crew hostage" premise rarely yields a very good story to begin with no matter how well executed it is and the fact that the ending wrapped things up way too quickly and cleanly given the stakes and you end up with a bit more of a mixed bag of an episode. It's never well established why the two remaining aliens couldn't simply resume their efforts to build android bodies now that their evil colleague is out of the way; all that rhetoric about temptations being too great seemed merely like a weak excuse to push a reset button and end the story as quickly as possible. Oops, so much for that potential alliance! That said, however, this is certainly an above average outing. An obscure gem. 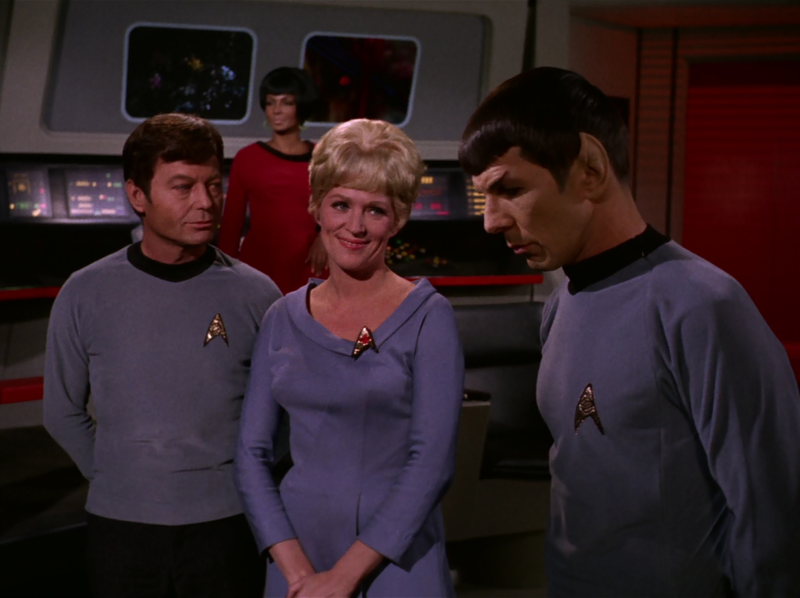 The character that takes over Spock is what makes the episode. 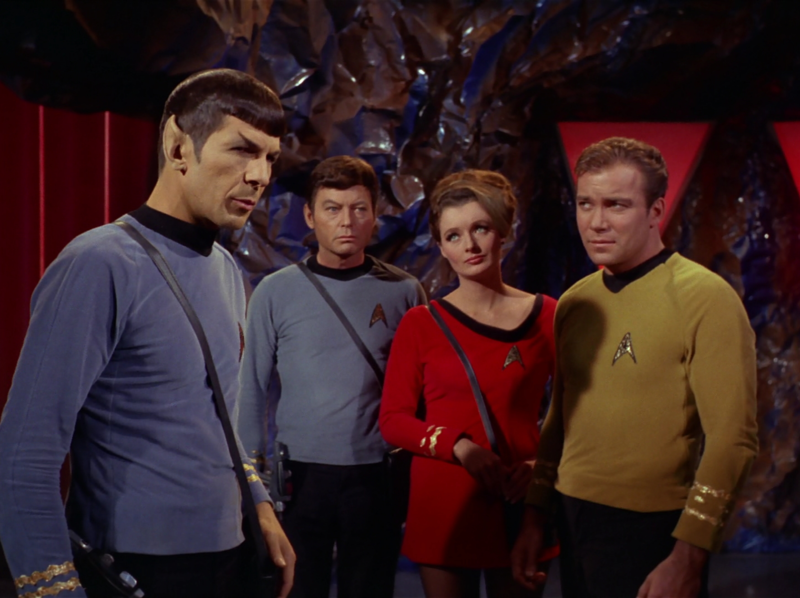 Lots of good lines between Kirk, Spock, McCoy, and Dr Mulhall, and it's a cool concept for an episode as well. The plot moves along nicely until the last 15 minutes when they start throwing in too many twists. However, there's still a deepness to the overall story as it does a large examination of the human condition (What does it mean to feel? What does it mean to be superior?). There's also a lot of heart in the performances of all the main characters. 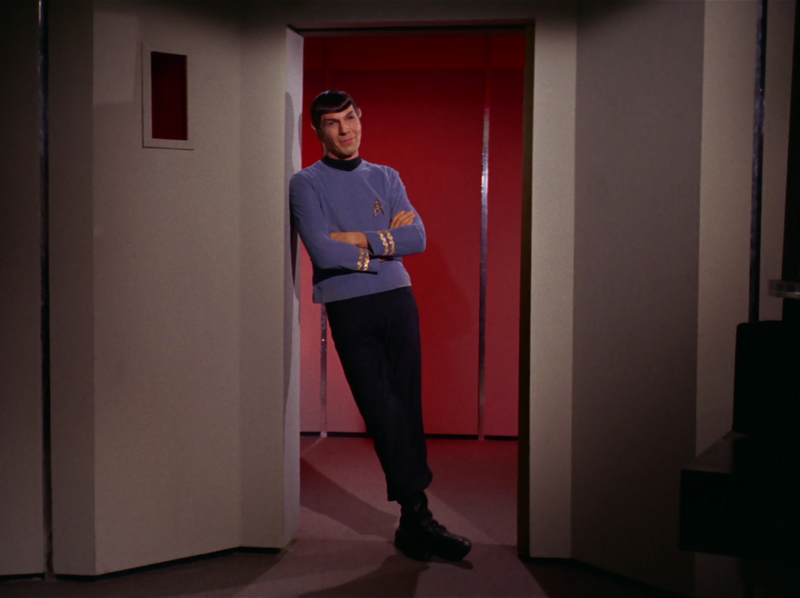 Specifically, I enjoyed Kirk's speech in the conference room, McCoy getting irritated about beaming down, the woman starting to regret he future transfer to the android, and last but not least, Spock's performance as a casual azz hole while being possessed. -At the beginning, they scan the planet and call it a class M, then they go on to say it has no atmosphere because it had been blown away. How is it a class M then? Don't you need air for that classification? -It seems that at some points in the episode, the "soul" of the person being possessed (Kirk, Spock, etc) has to be "traded" into the sphere, and at other points in the episode, they "share" the brain with the being. It just seems like the rules are not consistent. It's kind of hard to explain. Why does Dr. Mulhall wear red if she's an astrobiologist? Why isn't she wearing blue? 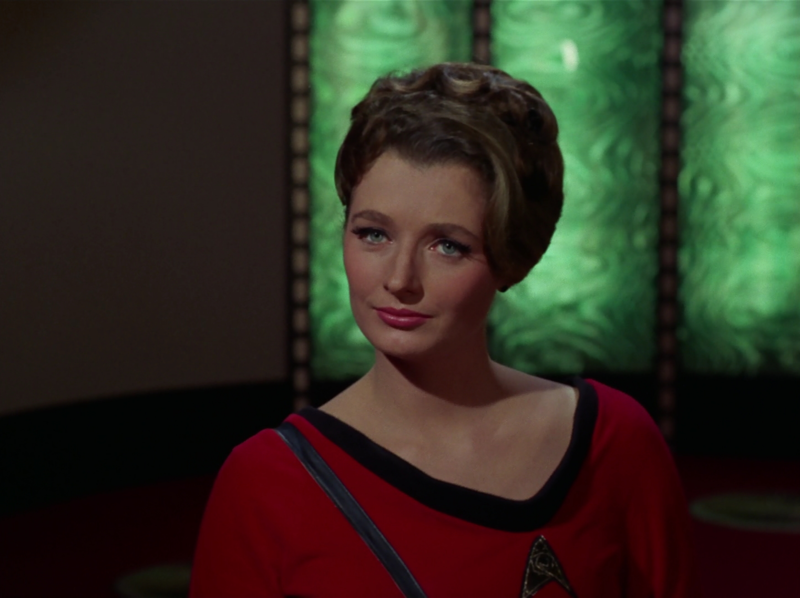 Factoid: Diana Muldaur who played Doctor Ann Mulhall went on to play Miranda Jones (Also a Doctor) in TOS: Is There in Truth no Beauty and also later portrayed Doctor Pulaski in the second season of The Next Generation. The ending is classic purification by death. Gill, who has obviously violated the Prime Directive AND proven why the Prime Directive is a vital Federation policy, dies in a hail of gunfire after confessing (making amends)his sins. To complete the purification, Melakon, who kills Gill, is himself assassinated by the new, younger order that will lead each world (tribe) to peace and prosperity where the lamb will lie with the lion. 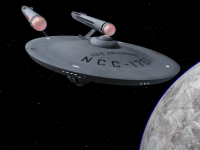 Star Trek used many age old dramatic vehicles but which were played out in space, instead on Terra Firma. I like this episode despite its overwhelming issues and nonsense. I love Kirk's motivational speech!!! Wow! Gave me goosebumps! ... still does! The problems with the episode though, are innumerable! - I don't see how anything could evolve from being a living being to pure energy in 600,000 years... Even the Organians, who are only slightly more powerful, not requiring receptacles, took millions of years to do their evolving! - Why would Kirk, knowing all about the Organians, and the Tralaine's of the galaxy think that THIS alien would be impossible to exist? - If they could build those cubbies along with the entire chamber, and along with the ability to control the Enterprise from under 100 miles of solid rock, it strikes me that it would be child's play to build their own robots without the need to hijack real humanoids. "Hands? We don't need no stinking hands!" - Since Sargon was able to live in the ship, he hardly needed the special chamber to exist in and he and Felicia could have existed in vacuum cleaners for all they cared! 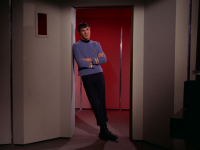 - Why wouldn't Sargon take over Spock's body instead of Kirk's? - It would've been cooler if he did take it and Felicia took Chapell's and they made a love story with those two! MUCH COOLER!!!! - Then have Kirk as the evil one in the weaker body! His over-acting would've been spectacular!!! Anyway, the problems all seem to get so convoluted that they step on each other and one could go on forever! Even after all of this, I still love the episode! Kirk with his typical arrogance about humanity and its 'wisdom' by not killing itself (remains to be seen). Scotty going on about the engineering problems of building decent robots even though he's well aware of Roger Corby's adventures, or the Nomad's of the galaxy.